Range: Found throughout the eastern three-quarters of Kansas; occurs on the High Plains only along the aquatic corridors of the Arkansas and Cimarron river valleys. 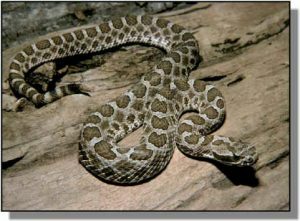 Description: Smallest rattlesnake in Kansas. Small pit on each side of head between and slightly below eye and nostril, a small rattle on the tail and nine large scales on top of head. Head, body, and tail are gray or light brown with 20–50 dark gray or brown blotches on back; smaller blotches on tail. Belly mottled, blotched or light with an indistinct pattern. Young look like miniature adults. Habits: Found in a wide variety of habitats ranging from arid open sagebrush prairie and rocky, prairie hillsides to open wetlands; seems to reach a peak of abundance in grassy wetlands such as Cheyenne Bottoms and Quivira National Wildlife Refuge. Diurnal during spring and fall and prowls at night during summer. Three to 13 young per litter are born in July and August. Eats frogs, lizards, other snakes, and rodents.